This April HATCH kicked-off its first cohort and welcomed eight aquaculture startups to Marineholmen for a three-month accelerator program. One of these startups is JALA, a company aiming to save the shrimp industry from the devastating shrimp diseases. In this interview with HATCH, Liris Maduningtyas - CEO of JALA - talks about the challenges the shrimp industry is currently facing, how to bring affordable technology out to small shrimp farms in Indonesia, as well as letting us in on the secrets of succeeding as a female entrepreneur in a male-dominated industry. Liris is an electrical engineer who started her career as a field engineer for Schlumberger. After working abroad for some time, Liris went back to Indonesia and met Alfie and Aryo, college Co-Founders of JALA, and entered the shrimp industry head-on. In short terms, what is JALA all about? And how did you come up with this idea? Aryo is a shrimp farmer and has been in the industry for 16 years. While being a farmer he realized that the shrimp farming technology is not good enough, especially in meeting the extensive global problem of shrimp disease. In 2001 shrimp disease almost wiped out the entire shrimp industry in Indonesia, and today the history has started to repeat itself. We therefore realized we need to do something about it. We need to monitor the water quality, which is the main problem why the shrimp disease can easily attack the shrimp farms. How much did you know about shrimp farming before you entered the industry? To explore the shrimp industry, I spent 2016 driving around to farms in Java, just knocking on their door, listening to their story and seeing what it is like out in the field. This made me realize that what JALA delivers is something that shrimp farmers really need. We have a IoT-monitoring system that allows farmers to know water the conditions in their ponds. By subscription (24 USD per month per pound) shrimp farmers can get monitoring systems and farm management systems combined, telling them what actions to take to realize precision farming. We are currently at 90%. The technology is already ready to enter the market. During 2017 we did field-testing in 135 ponds in Java, Indonesia, and we are really looking forward for the expansion. What are the main challenges you need to overcome in order to enter the market? The first aspect is the manufacturing process; we currently build our hardware in-house, which we can handle now, but soon, as the demand increases, we need to find a way to do it out-house. A second aspect is the market challenge; the smaller farmers which we want to target, generally don’t want to spend much money on new technology. We thus have to use other channels so that smaller farmers can still be able to use our technology. Do you think your technology is disrupting the shrimp industry? Are you trying to replace existing products? Shrimp farmers currently spend around 6 300 USD to hire a shrimp expert just to articulate data from manual devices, which is something that is not affordable for most of the smaller farmers. 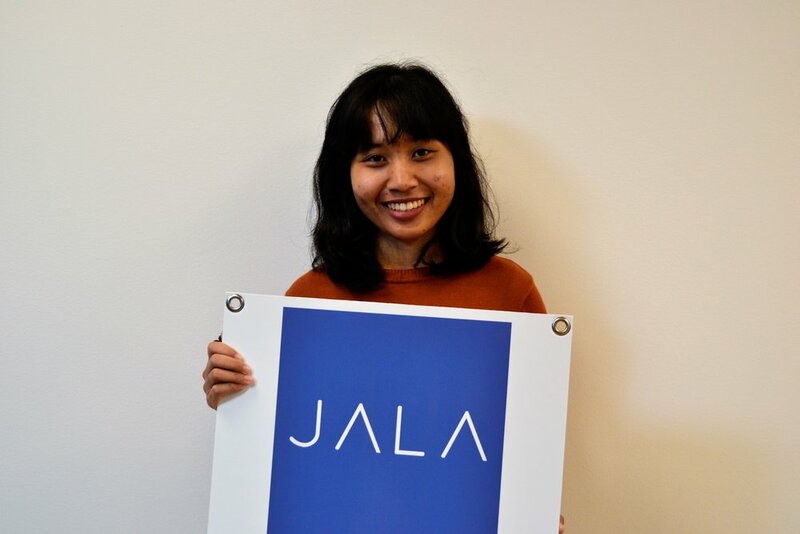 An online subscription company like JALA will replace this existing system, allowing shrimp farmers to get the information they need at a much more affordable cost. So yes, our technology is definitely disruptive. "It’s huge! Shrimp is one of the top three seafood products in the world, and the industry just keeps increasing from year to year." In Indonesia we have 140 000 hectares of shrimp farms and 95 000 farmers. 20% of these farms are intensive farms, covering around 30 000 hectares, which is our initial market. The Indonesian shrimp industry furthermore captures 6% of the global market, a market that is worth approximately 22.5 billion USD, so our market potential is enormous. What do you consider the main challenges in the shrimp industry today? Shrimp disease, definitely! It is a global problem - it can kill all of your shrimps within two days, or a day, if you don’t do something for prevention. The farmers in Indonesia are currently only able to achieve 60% of their optimum capacity because of shrimp disease. 90% of the farms in South East Asia are already infected. How will JALA’s products decrease these mortality and disease problems? We create a monitoring system so that we can track water quality data. This data of water quality is important as you cannot see the shrimps beneath the water. "By knowing the water quality, we can predict when the ponds are going to have a disease outbreak, and we can do early detection and prevention of disease." We can also ensure stable water conditions; if you have a stable water quality conditions your shrimps will be healthier, and the shrimps will develop a better immune system to fight of the disease. In terms of all the chemicals that are being used in the shrimp industry, do you think your products are going to reduce the amount of chemicals and antibiotics that is currently used? Yes, the decision support systems inside JALA are based on environmentally friendly solutions. We don’t use antibiotics in our decision support systems, we only use natural medicine. Yes! Actually, we have met a lot of startups which also are in the HATCH accelerator program which really match with our industry - a certification company, a trading company, a data analytic company, a market place company, and a hardware company. So definitely it is going to be future collaborations! Yes, absolutely! Here in Bergen we are already looking into collaboration with Cargill and Skretting, the two largest feed companies in Norway making feed for the shrimp industry. We are also searching to collaborate with fish health R&D companies such as PHARMAQ and PatoGen, and aquaculture machine learning companies like Aquabyte and Seasmart. It’s exciting! What I really like about the HATCH accelerator is the intensive program for each cohort. We are required to be one step further every day, every week. There is also an objective with every day, helping us to redefine our business model, to redefine our market mapping strategy. With this pace I think we’ll be ready for a fundraising soon! That was a question I asked myself before I came here! But as soon as I got here I saw that a lot of the companies in the European aquaculture network are based here; Cargill, Lerøy, Marine Harvest, PatoGen, PHARMAQ etc., as well several research institutes. All of these companies are now within reach, which definitely is a benefit for us. Would you recommend other aquaculture startups to apply to the next cohorts? Why? Yes, I have already done that! I have recommended this program to some of our friends in Indonesia that are also working in the aquaculture industry. What is it like to be a female entrepreneur? I have eight people in my company and I am the only female, and now I am the CEO. It is a wonderful job! Of course, it is a tough job, but I really like it. Next up is to hire more female workers to join our team! "To all girls out there considering becoming entrepreneurs I want to say: Don’t just sit at home, get out there, build something, make an impact, it's worth it!"